Nice big cookie jar measures 10" tall, and is made of hand painted ceramic.Made by Sherwood Brands. Nice condition. There seems to be a few tiny rough glaze chips that looks like they have been touched up, upon close inspection. 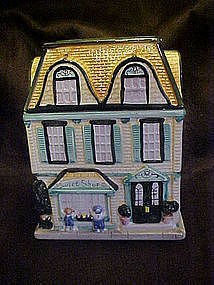 The cookie jar has two sides, one side a Sweet shop and the other side looks like a regular victorian building. Email if you need to see the other side photo.